Judge James L. Roberts Jr. of Pontotoc will present his portrait to the Mississippi Supreme Court on Jan. 18 at 11 a.m. during a ceremony at the Supreme Court Courthouse in Jackson. Judge Roberts, who is a Circuit Judge on the 1st Circuit in north Mississippi, previously served for six and one-half years on the Mississippi Supreme Court. He was elected to the Supreme Court in 1992 and took office early, on Sept. 28, 1992, after Justice James Lawton Robertson left office early. Roberts resigned from the Supreme Court March 1, 1999. Judge Roberts said that he wanted to present the portrait to the Supreme Court before Chief Justice Bill Waller Jr. retires. Chief Justice Waller, who will retire Jan. 31, is the last of Roberts’ former colleagues still serving on the Supreme Court. The portrait of Justice Roberts will become part of the Supreme Court's historic collection, which includes more than 40 portraits of justices who served from the 1800s to modern times. Artist Robbie Boyd of Pontotoc painted the portrait. “I’ve known her a long time. I have high regard for her work. I wanted her to do it because she is a Northeast Mississippian,” Judge Roberts said. Boyd also painted the portrait of former Presiding Justice Kay B. Cobb that was presented to the court in September. Boyd’s portrait of former Gov. Bill Allain was hung in the Hall of Governors at the Capitol in January 2018. Judge Roberts said he was a justice on the court during a time of significant transformation in the judiciary. The Legislature created the Mississippi Court of Appeals, an intermediate appellate court, at the urging of justices under the leadership of then-Chief Justice Armis Hawkins and the leadership of the Mississippi Bar. The Court of Appeals, which began hearing cases in January 1995, was created to speed appeals and relieve a backlog of cases before the Supreme Court. Setting a new court in motion required extensive work by the Supreme Court. The Supreme Court wrote the rules under which the Court of Appeals operates. Roberts also was a member of the Building Committee that scouted Jackson properties and rented a building to house the Court of Appeals. The Court of Appeals remained in the rented building on North State Street for 13 years. Judge Roberts, 73, notes that he is among only a few who have served on three of the four courts created by the Mississippi Constitution. The only constitutionally created judgeship he hasn’t held is Justice Court. His first judicial service was as chancellor in the 1st Chancery Court District for almost five years, beginning in January 1988. His progression of judicial service has been unusual. His next judicial post after leaving the Supreme Court was as Pontotoc Municipal Judge. He currently serves as a Circuit Judge of the seven-county 1st Circuit District, a position he has held since December 2007. The 1st Circuit includes Alcorn, Itawamba, Lee, Monroe Tishomingo, Pontotoc and Prentiss counties. He became Pontotoc County Prosecuting Attorney in 1971, the same year he earned a Juris Doctor from the University of Mississippi School of Law. He served as prosecuting attorney for 12 years while also maintaining a private civil practice. Gov. Allain appointed him Commissioner of the Department of Public Safety in 1984. He also taught for six years in the University of Southern Mississippi criminal justice program. 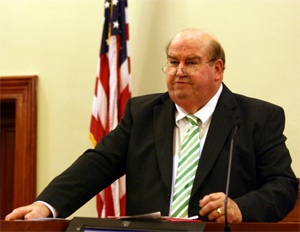 Judge Roberts received the Mississippi Bar’s Lifetime Achievement Award in 2012. He received the Distinguished Jurist Award at Mississippi State University in 2014. He was chairman of the Governor's Commission on Juvenile Justice, a member of the Board of Governors of the Mississippi Judicial College and the Mississippi Bar Foundation. He currently serves on the Commission on Judicial Performance.